Hello it is most good news in this year for whom who were looking government jobs in Gujarat. GSSSB has is released a notification for recruit of 4000 new vacant of Surveyor, Instruction and pro officer, Candidate who are looking job of instructor can apply for job online. Here I am going to inform complete details about the Jobs in Gujarat. Aspirants are suggested to read the article for apply job online in Gujarat. Here at below we have updated the name and number of posts. How in apply in GSSSB, Age limit for apply in Gujarat SSSB, Application fee and Process of apply for job in GSSSB. Age limit: Candidate who want to apply in vacancy of GSSSB their age should be between 18 years to 30 years. Educational Qualification: If you are willing to apply in job of GSSSB then you must be hold Bachelor degree from the recognized university of government of India. Selection: Candidate will be get selection on basis of written exam and interview which is held by department. 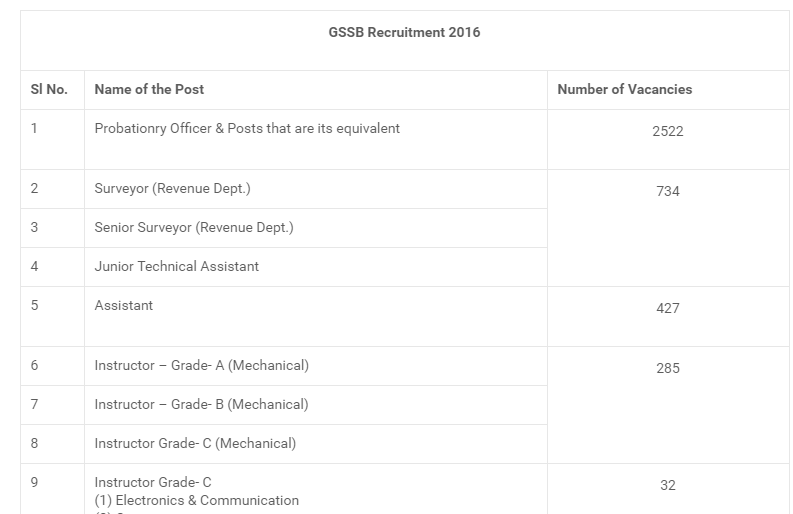 Important Information: If you are willing to apply for job in GSSSB then you must fill online form last date by 20th June 2016.